Good morning, and welcome to a Mueller-free newsletter. My latest column looks at the rhetorical wars over the Green New Deal — and has some news on when we can expect the actual policy. I'll share a glimpse of that and then Ben Geman will get you up to speed with the rest of today's news. Driving the news: The Senate is set to hold a procedural vote this week to begin debating the GND. Democrats are expected to vote "present" to show unity and oppose Republicans’ efforts to highlight divisions on the left about the proposal. Where it stands: The backers of the GND, which include youth-led activist groups like the Sunrise Movement, have amassed an impressive amount of support for the proposal from Democratic presidential candidates and congressional progressives, in particular Rep. Alexandria Ocasio-Cortez, whose attention guarantees limelight. The intrigue: New Consensus, a new nonprofit pivotal in shaping the GND with Ocasio-Cortez's office, is working on a report to be released early next year that will be the policy nuts and bolts of the plan. One of its experts, Rhiana Gunn-Wright, said they're getting input now from people affected by climate change and acting on it, particular low-income and minority people. She concedes it's leaving a void in the meantime. "I think the idea is you never let your message get too far out ahead of the substance and we have definitely created a vacuum and left space for people to fill with what they think the Green New Deal is based on their assumptions and past experiences. It’s certainly a danger, but it’s a danger worth taking by ensuring we get frontline voices in," Gunn-Wright said. 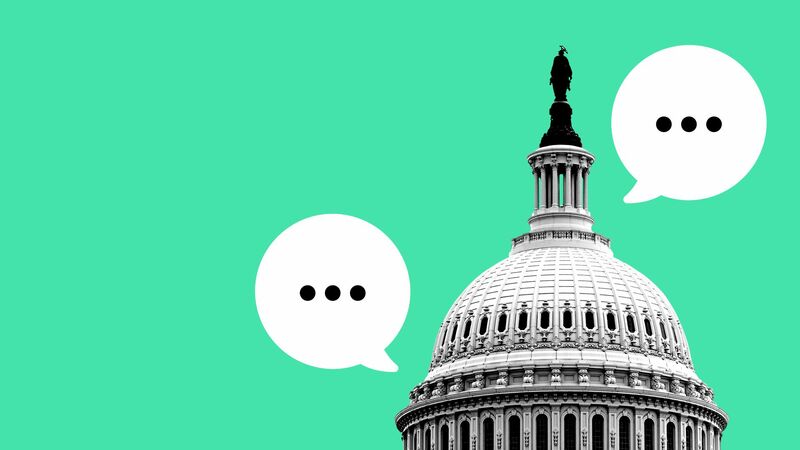 What’s next: This week’s Senate debate is designed to maximize political messaging and minimize substance. Crude oil prices have backed off their 4-month highs from last week amid "fresh signs that global growth may weaken further," Bloomberg reports. WTI crude was trading around $58.90 per barrel and Brent was at $66.43 this morning. The big picture: The decline comes despite OPEC and Russia's supply limiting deal and U.S. sanctions against Iran and Venezuela. Bloomberg also flags data released Friday that show a drop in the number of active U.S. rigs — a signal that surging production growth could slow — plus several reports note that new Federal Reserve data are weighing on traders. "Concerns about a potential U.S. recession resurfaced late last week after bearish remarks by the U.S. Federal Reserve, with 10-year treasury yields slipping below the three-month rate for the first time since 2007," Reuters writes. There are also concerns about the state of the ship in Europe. "Fears of a deepening slowdown rattled financial markets in Europe and the US on Friday following the readings showing manufacturing activity in Germany and France had weakened," the Financial Times notes in a story on crude prices. Remember last week's revelation that Carbon Engineering, a firm trying to commercialize machines that directly pull CO2 from the air, raised $68 million? It's hardly the only action in the wider carbon removal space. Driving the news: Silicon Valley startup accelerator Y Combinator has thrust carbon removal startups into the spotlight amid growing concerns over climate change, Axios' Kia Kokalitcheva reports. How it started: In October, YC asked for program applications from startups and nonprofits working to remove carbon dioxide from the atmosphere. Still, the two relevant startups that participated in YC's most recent accelerator program, which concluded last week, are using better known approaches — providing project verification for carbon offsetting projects and turning carbon dioxide into a fuel — than the techniques highlighted in October. 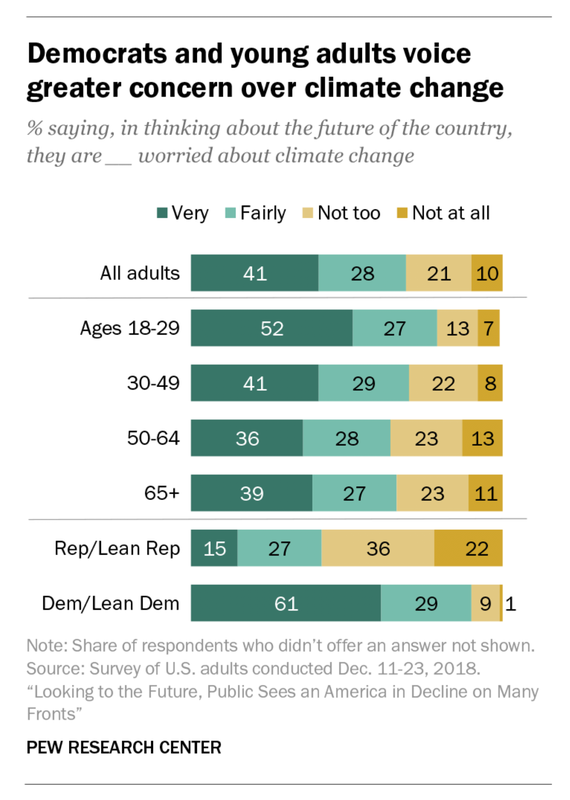 By the numbers: A Pew Research Center survey shows that 79% of adults aged 18–29 are very or fairly worried about climate change when they think about the future of the country. That's compared to 69% for adults as a whole. There's also a sharp partisan divide, as you can see from the chart above. Climate change: The International Energy Agency is on the cusp of releasing its latest analysis of global CO2 emissions from energy. The report will offer a "snapshot of recent global trends and developments across fuels, renewable sources, and energy efficiency and carbon emissions," the agency said. Why it matters: Global CO2 emissions have been rising again in recent years after a 3-year plateau. GND: This week the Senate is slated to a hold procedural vote on whether to debate the GND resolution, as Amy noted above. What to watch: Democrats plan to vote "present" in an effort to show a united front, and could also seek to put Republicans on record about human-induced climate change. Interior: The Senate Energy and Natural Resources Committee gathers Thursday to vet the nomination of acting Interior Secretary David Bernhardt to formally get the top job. He's a former lobbyist whose clients included oil and gas interests. Appropriations: Lawmakers on both sides of Capitol Hill will begin vetting the White House's fiscal year 2020 budget request. Why it matters: White House budgets are just wish-lists, but the hearings offer a window onto administration policy views and goals. Energy Secretary Rick Perry will appear Tuesday before a House Appropriations panel and similarly testify Wednesday before a Senate Appropriations subcommittee. The DOE proposal calls for steep cuts in renewable energy and efficiency programs, but lawmakers have rebuffed those efforts in recent years. A separate House Appropriations panel meets Tuesday to review Interior's budget plan.